Braising normally requires browning the emat before placing it in a casserole dish and cooking for a long time, usually covered, in a small amount of liquid. It can be cooked on the stove or in the oven. Warm a little olive oil in a large ovenproof casserole set over a medium heat. Add the bacon and fry for 1 to 2 minutes, until coloured. Remove the bacon with a slotted spoon and set aside, then add the rib roast and sear it on all sides. Remove the rib roast to a plate and add the vegetables and garlic. Cook for 4 to 6 minutes, until golden brown. Add the flour and cook for 1 or 2 minutes to brown it too. Add the beef stock and wine, then return the rib roast to the casserole with the bacon. The rib roast should be just covered with liquid. Add the herbs and Worcestershire sauce. Cover the casserole dish and place in the oven to braise for about 3 hours, checking each hour to ensure enough liquid is still in the casserole dish. Meanwhile, to make the cauliflower cheese, bring a large pan of salted water to the boil. Add the cauliflower florets and cook for 5 to 8 minutes, until tender. Drain thoroughly, then place the cauliflower florets in an oven proof dish and set aside. Melt the butter in a small pan, then add the flour and cook, stirring continuously over a low heat for 1 minute, until the mixture becomes a pale white. Gradually whisk in the milk, then bring to the boil for 2 minutes, stirring until thickened. Remove from the heat and stir in the cheese and mustard. Check the seasoning at this stage. Heat a little oil in a large frying pan and cook the streaky bacon for 2 to 4 minutes, until crisp and golden. Add to the blanched cauliflower, then pour the sauce over the cauliflower to cover. Bake for the last 30 minutes in the same oven that the rib roast is cooking in, until the gratin is golden and piping hot. 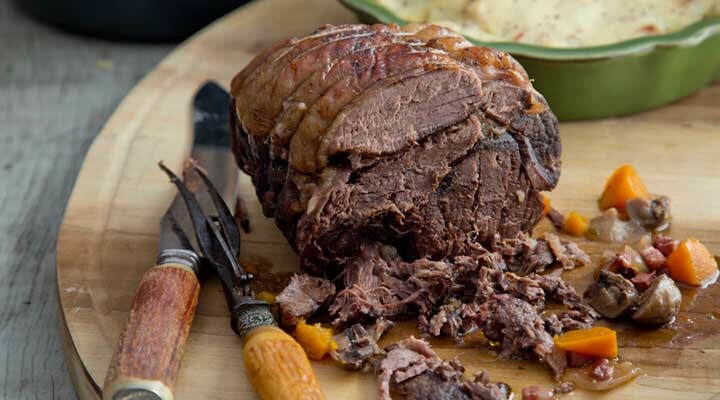 Serve the rib roast, slightly pulled, with the cauliflower cheese and some of the delicious jus from the casserole.